Enable Live View by pressing the Live View switch to the right and releasing it. In Guide mode, you actually don’t have to flip the switch: Instead, when you reach the final guided screens, select Start Shooting (left screen) and then Use Live View (right screen). The camera enters into Live View mode automatically. Review the current picture settings (exposure, focus mode, and so on). 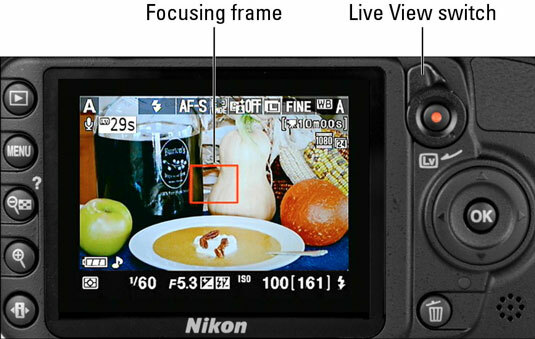 In Live View mode, the Shooting Info screen, which normally displays the critical picture settings, isn’t available. But you can view most of the same settings on the Live View display. Select the Focus mode and AF-area mode settings. Both can be adjusted via the Quick Settings display. Adjust other picture settings as you do for viewfinder photography. The fastest option for most settings is to press the Info Edit button to toggle to the Quick Settings display. To focus manually, twist the focusing ring. To use autofocusing, use the Multi Selector to position the focusing frame over your subject. The appearance of the frame varies depending on your selected AF-area mode. In AF-F Autofocus mode, wait for the focus frame to turn green and then press the shutter button halfway to lock focus. In AF-S Autofocus mode, press the shutter button halfway to focus. Focus is locked when the focus frame turns green. Regardless of the autofocus mode, exposure metering is adjusted up to the time you take the picture. 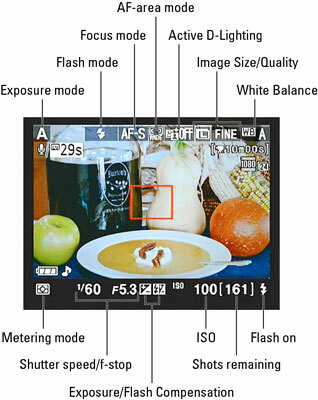 In Auto or Auto Flash Off mode, the camera may switch automatically to one of the Scene modes. In the Auto and Auto Flash Off modes, the camera makes a guess about what type of scene you want to capture. If the camera determines that your subject doesn’t fall into one of those four categories, it sticks with the Auto or Auto Flash Off mode. Exposure compensation adjustments aren’t always reflected by the monitor brightness. When you increase or decrease exposure using this feature, available only in the P, S, A, and M modes, the image on the monitor becomes brighter or darker only up to shifts of +/- EV 3.0, even though you can select values as high as +5.0 and as low as -5.0.